Saraji returned to Fort Hood, only to find Sergeant Duncan writing him up yet again. According to Saraji, when Sergeant Duncan learned Saraji had nearly attempted suicide, he coolly told Saraji that he should go kill himself. Luther, a former sergeant who served 12 years in the military and is a veteran of two deployments to Iraq, where he was a reconnaissance scout in the 1st Cavalry Division, is appalled by Saraji’s treatment by his superiors. Saraji’s is but one of 20 other cases Luther is working on, in hopes of avoiding yet another disaster like the one that occurred on November 5, when Major Nidal Hasan, suffering from a combination of secondary trauma and dealing with major ongoing harassment for being a Muslim, went on a shooting spree that killed 13 soldiers and wounded dozens more. Dr. Kernan Manion is a board-certified psychiatrist who was hired last January to treat Marines returning from the occupations who suffered from PTSD and other acute mental problems born from their deployments. Working for a personnel recruiting company that was contracted by the Defense Department, NiteLines Kuhana LLC at Camp Lejeune, the largest Marine base on the East Coast, Manion not only quickly became all too familiar with the horror stories soldiers were telling him during their therapy sessions, but he became alarmed at the military’s inability to give sufficient treatment to returning soldiers, and even more so at their reports of outright abuse meted out by some commanders against lower-ranking soldiers who sought help. This episode is just one that is indicative of pervasive and worsening systemic problems afflicting a military mental health care system that is not only overburdened, overstressed, understaffed and ill-equipped, it is exponentially worsened by its being administered by career military with rank, but who are ill-trained to provide the complex psychiatric expertise necessary to effectively treat psychologically impaired soldiers from both occupations. Manion explained to Truthout that upon returning home, troops suffering from myriad new-onset deployment-related mental health problems were flooding the available resources, and when they did come they had to bear the brunt of pervasive harassment and oftentimes outright psychological abuse from Marine Corps superiors who refused to acknowledge the validity, much less the severity, of their problems. Manion continued to warn his superiors of the extent and complexity of the systemic problems, and he was deeply worried about the possibility of these leading to violence on the base and within surrounding communities. Rather than being praised for his relentless efforts to address these concerns, Manion was fired by the contractor that hired him. While a spokeswoman for the firm says it released Manion at the behest of the Navy, the Navy preferred not to comment on the story. Manion told Truthout that while working at Camp Lejeune, he was deeply concerned with the fact that he was seeing an inordinate number of Marines grappling with overwhelming suicidal or assaultive impulses, and felt, like others, that this was clearly indicative of the residua of extreme combat stress. The proof was already available – in 2008, according to the Marine Corps, at least 42 Marines committed suicide, and at least 146 others attempted to do so. Manion, who was already concerned about the increasing likelihood of violence among post-deployment Marines at Camp Lejeune, charged that medical officials at the Deployment Health Clinic where he worked simply refused to study and discuss violence among these returning Marines and work on a coherent response. Authorities at Camp Lejeune, according to Manion, did little planning to improve the handling of troubled Marines in most desperate need of treatment for their PTSD. The national evidence was clearly apparent; those who were not getting necessary care were killing themselves and other soldiers in startling numbers. Manion remained deeply committed to confronting the ongoing reported harassment from their superiors of Marines who were seeking mental health care. Despite being warned to essentially stop making trouble by the national director of the contractor he worked for in June, Manion felt compelled to continue with his appeals because he was not seeing the changes necessary to prevent the already bad situation from deteriorating further. Because of even more flagrant offenses, on August 30 he appealed urgently to multiple military inspectors general in a written complaint warning of an “immediate threat of loss of life and/or harm to service members’ selves or others” if conditions did not improve. Finally, Manion warned his superiors that the lives of “many patients” were imminently at risk, concerning a disruption in care that would result from a decision that his superiors made that would prohibit him from seeing his patients. Four days later, Manion, with 25 years of experience as a psychiatrist who specializes in PTSD and traumatic brain injury, and with an investigator from the inspector general’s office just having arrived, was fired on the spot by the contractor and escorted out of his office by an armed MP. His warnings, like those at Fort Hood, went unheeded at Camp Lejeune. Was Manion surprised when he learned that Hasan was a psychiatrist who had been treating traumatized soldiers? Manion holds deep concern for the future of both the soldiers themselves as well as those who treat them. When asked if he thinks the military will incorporate the changes necessary to rectify these problems, Manion took a long, deep breath before answering. The warnings of Luther and Manion have already proved prophetic. On November 22, Killeen police reported that a 20-year-old Fort Hood soldier, Army Specialist David Middlebrooks, was stabbed to death. The next day, 22-year-old Joshua Wyatt, another Fort Hood soldier, was shot to death in his residence. The killers of both soldiers are alleged to be Fort Hood soldiers as well. Yet killings involving Fort Hood soldiers have been commonplace in recent years, even prior to the mass killing on November 5. In the years leading up to that event, soldiers from Fort Hood were involved in the deaths of at least seven people in the previous five years alone, several of these incidents being soldier-on-soldier violence. Taking one of these as an example, in September 2008, Specialist Jody Wirawan fatally shot 1st Lt. Robert Fletcher. When Killeen police arrived, Wirawan proceeded to commit suicide. In addition, Luther told Truthout that at least two soldiers at Fort Hood have attempted suicide since the massacre on November 5. And the killings are not limited to Fort Hood. Less than 12 hours after Maj. Nidal Hasan’s shooting spree, Camp Lejeune officials discovered the body of one Marine and took into custody another Marine, Pvt. Jonathan Law, who was accused of killing his colleague. Law, who had served a seven-month tour in Iraq, was also suffering from self-inflicted wounds when arrested. In upstate New York in the town of Leray, on the outskirts of Fort Drum, home of the 10th Mountain Division, between November 29 and 30, soldiers Waide James, 20, and Diego Valbuena, 23, were murdered by Joshua Hunter, another Fort Drum soldier, according to Jefferson County Sheriff John Burns. Both victims died of multiple stab wounds. On September 29, after being refused any assurance that the patients who were in his care were OK, accounted for and being taken care of, being worried about his patients, and five weeks before the massacre at Fort Hood, Manion sent a letter to President Barack Obama, as well as copies of the letter to Vice President Joe Biden, Secretary of Defense Robert Gates, Chairman of the Joint Chiefs of Staff Adm. Mike Mullen, ranking member of the Senate Committee on Veterans’ Affairs Sen. Richard Burr, and Sens. Carl Levin and John McCain of the Senate Armed Services Committee, among several others, including the secretary of the Navy, and the commandant and sergeant major of the Marine Corps. 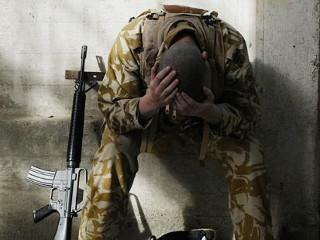 With President Obama’s recent announcement to send an additional 30,000 soldiers to Afghanistan, concern for the already immense mental health crisis is increasing. Now, more than ever before, the US military needs a comprehensive health plan initiative to meet the radically different psychological implosions that are occurring due to the occupations of Iraq and Afghanistan.